The article can be viewed or downloaded in PDF format at bottom of the page. The weak equivalence principle is easily derived from QGD’s equation for gravity where and are respectively the masses of and and the distance, all in natural fundamental units. According to QGD, the change in momentum of due to gravity between two points in space is exactly equal to the gravity differential between two points . That is . QGD defines speed of a body as , so the acceleration of a body is . Since , the acceleration of an object due to the gravitational interacting between and is . Since then . Therefore, gravitational acceleration of an object towards is independent of its mass and only depends on , the mass of the objects it falls toward, and the distance it travels. Conversely, the gravitational acceleration of an object towards is given by is independent of . We have shown that the weak equivalence principle is a direct consequence of QGD’s equation for gravity which itself is derived from QGD’s axiom set and by doing so, have promoted the principle to a law. However, there is an inherent problem arising from the equivalence principle when describing a system from the acceleration imparted by gravity. The problem is it hides intrinsic physical properties which allow us to distinguish between objects. Since gravitational acceleration of an object is independent of its mass or composition, then the effect gravitational does not inform of those two intrinsic properties. According to QGD, the momentum of object is an intrinsic property given by where is the number of bounded of and each correspond to the momentum vector of a bounded . The speed of object is is given by . Given two object and both at the same distance from a massive structure, the equivalence principle makes it impossible to distinguish between them based on their respective acceleration, which makes acceleration the wrong property to measure if one wants to compare the effect of a force on particles, structures or frames of reference. To distinguish, for example, between gravitationally and non-gravitationally accelerated objects or systems of objects, we should measure, for example, the imparted changes in momentums which as we will see are not only mass but also force dependent. Changes in momentum of an object due to gravitational interaction is independent of its mass while changes in momentum due to non-gravitational interactions is mass dependent. The equivalence Einstein suggests is not equivalence between the gravitational and inertial masses, but an equivalence between gravitational and non-gravitational forces. Let us consider the experiment in figure 1 based on Einstein famous thought experiment. Here we have two rooms; a green room and a red room. Each room is a rectangular rigid structure possessing the same mass and structure. In each room a rigid rod fixed on one end to the ceiling and its other end is rigidly attached to a sphere of equal composition and mass. The green room is at rest in gravitation field. The red room is imparted and acceleration by the force such that that . The force being non-gravitational (the thrust of a rocket engine to take common example), its imparted momentum propagates from the point of application through the rest of the structure. Here, the momentum is imparted first to the floor, which then imparts it to the sides of the room, which then imparts it to the ceiling, which then pulls the rod and lastly imparts momentum to the sphere. The experiment consists of randomly releasing the spheres and determine whether or not instruments within each room will measure the same dynamic changes. The sphere in the green will accelerate uniformly at the rate describe by QGD equation for gravity (of which Newton’s law is an approximation). As we have shown, the acceleration here is independent of the mass of the sphere. However, at the moment the sphere in the red room is released, the momentum imparted to the room by no longer reaches the sphere. The sphere stops accelerating and will move at the speed it had when it had when released until the floor accelerating towards the sphere impacts it. Also, since the acceleration of the red room with the sphere attached is , at the moment the sphere is released, the mass which is subject to decreases by the mass of the sphere so that . If the mass of the sphere is a significant portion of the total mass of the system, then from within the red room, instruments will measure a sudden change in the rate of acceleration the instant the sphere is released and an equivalent sudden deceleration when the floor finally impacts the sphere. The change in the rate of acceleration when the sphere is release is . The instruments in the green room will show no such change in the rate of acceleration. It follows that we can distinguish between a uniform gravitational field and an equivalent uniform acceleration simply because there can’t be a uniform non-gravitational acceleration. Of course, one may object that we can assume a mechanism which by will the force acting on the red room will be adjusted to compensate for the drop of the sphere. But that would imply communication of the exact moment at which the sphere is released in the green room, which would imply that measuring equipment and communication devices different from those found in the green room and prior knowledge of the distinction between the different accelerations. But then, we may assume that the exact same equipment is installed in both the green and red rooms, but that wouldn’t solve the issue since monitoring the communication equipment would show distinguishing behaviour. 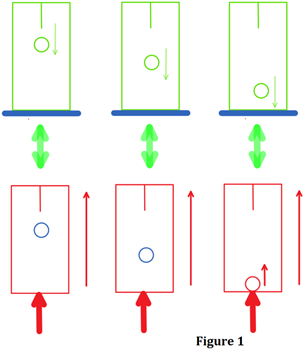 The signalling of the impact of the sphere on the red room floor would be sent sooner after release than the signaling of the impact of the sphere in the green room. Contrary to Einstein’s statement we can show that it is always possible to distinguish between a gravitationally accelerated frame of reference and a non-gravitationally accelerated frame of reference. At this point, if he hasn’t earlier, the reader should ask how to explain the bending of light in proximity of massive structures or the slowing down of clocks due gravity; two important predictions of general relativity which require Einstein’s equivalence principle? For answers to these questions as well as the derivations of the gravity and the laws of motion from a simplest axiom set that can describe dynamic systems, we refer the curious reader to An Axiomatic Approach to Physics. Now consider figure 2 showing an experiment also inspired by Einstein’s thought experiment. Here, each room has a laser rigidly attached to the left wall firing photons towards the opposite wall. The first and second diagrams from the left respectively show what an observer in the green room and an observer in the red room will see. Without the assumption of equivalence, an observer in the red room must conclude that the curvature of the path of light describes the motion of the red room relative the trajectory of the photons (which without Einstein’s equivalence principle the observer must assume is along a straight line). If QGD’s description of space is correct, the distance travelled relative to the photons trajectory axis can be used to calculate the speed of the room along the axis of motion which would then be given by . This implies that given if we positioned three lasers in the red room so that the trajectories of their beams are perpendicular to each other, then the absolute speed of the room, which is the speed relative to quantum-geometrical space, would be given by . 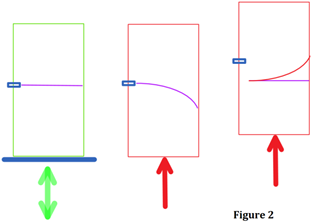 Since we’re essentially describing classical motion, from the curve or the trajectory (figure 3) the observer can determine if the room is accelerating, decelerating or moving at constant speed. This illustrates an essential distinction between quantum-geometry dynamics. Physical properties such as position, momentum, speed, mass of any particle or structure is independent of the frame of reference. Position is absolute in quantum-geometrical space and momentum, energy and mass are intrinsic to the particles and structures. This is discussed in some detail in An Axiomatic Approach to Physics. Note: see below for PDF version. This entry was posted on Thursday, May 12th, 2016 at 11:10 am	and is filed under Quantum-Geometry Dynamics. You can follow any responses to this entry through the RSS 2.0 feed. Both comments and pings are currently closed. « Could the LIGO have picked up some seismic activity?